In our body image conscious society, it’s rare to actually wantto gain weight. But if you’re anything like me, stuck with a high metabolism and lanky frame, it’s really tough to put on any amount of weight. Food is the obvious solution, but what should we be eating? You don’t want to fall into the trap of junk food: those empty calories won’t help. Finding healthy and cheap foods to gain weight is essential.You need to find something that you like, that you can afford, and something that’s good for you. No pressure, right? Here are a handful of healthy food choices for putting on weight. Add a few of these to your diet and eat regularly, and you’ll see amazing things happen. DID YOU KNOW: The average man needs about 2000 to 3000 calories per day. A woman needs about 1600 to 2400 calories. To gain any weight, you need to exceed that amount, probably to the tune of 500 calories per day. Let’s start with making sure you’re eating a complete meal. If you want to gain weight by eating healthy foods, you’ll also want to ensure a balanced diet. Each meal should contain at least one carb, a protein source and a veggie of some kind. Rice is one of the most popular grains in the world, and it’s packed with a ridiculously high amount of energy. 100 grams of rice contains about 130 calories, and it’s a very inexpensive food to buy. Simply adding a generous portion of rice to your meal can add hundreds of extra calories. What’s more, it’s a very digestible grain with none of the gluten issues faced with wheat. Rice contains many essential vitamins, such as thiamin and niacin. It’s easy and quick to prepare, particularly if you have a rice maker.Meal tip: a rice and bean burrito is an energy packed, protein rich, healthy and delicious way to enjoy this grain. Granola is a great choice. It’s not only a tasty breakfast cereal, it’s also loaded with energy, protein and fibre, as well as calories. One cup of granola contains over 450 calories, and that’s without adding milk! A granola bar contains a similar amount. Another key advantage to granola is it’s quite healthy. As long as it’s not too sugar filled (and some types really are), you can eat it all day long.Add a bowl or bar several times a day, and you’ll see some healthy weight gain happening in no time. You’ll find peanut butter on a lot of these lists, and it’s there for good reason.There are 90 calories, 4 grams of protein and 3 grams of carbohydrates in a tablespoon, and it’s not hard to love. 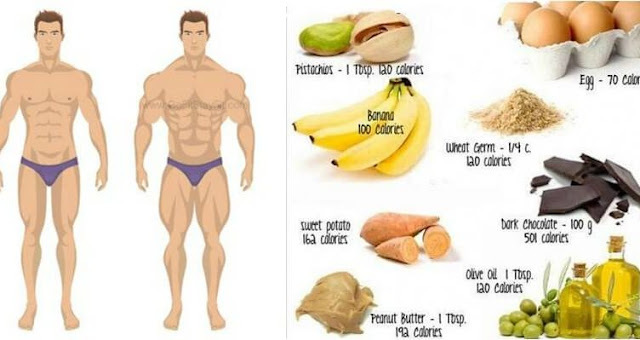 It does contain a bit of saturated fat, so don’t go too crazy on this one, but it’s a healthy weight gain food to add to your routine.Peanut butter also happens to go really well with the next item on this list. Bananas have the benefit of being affordable, convenient and really tasty! The average banana is a great food for putting on weight because it has about 100 calories.Bananas also have some fibre and a good helping of potassium, an essential vitamin in your diet. Bananas have a lot of sugar. For that reason, I recommend them as a post-workout snack when your body is after that easy energy. I also recommend you don’t pound six of them in one go, even if they are delicious. Because it’s a fish, tuna is an extremely healthy protein that contains many of the essential oils that your body needs to operate smoothly.Tuna is also really easy to prepare (if you go canned), and it works in a lot of different dishes, so it’s an easy addition to your meal plans. Have you tried seared tuna steak before? It’s amazingly delicious!Tuna is a healthy and inexpensive food for gaining weight quickly, it’s a very good protein source, and I recommend adding more to your diet. Maybe you’ve seen the Rocky movies where he’s chugging raw eggs as part of his workout. Let’s be clear, that’s not what I have in mind!Eggs are super nutritional, and there’s a reason that they’re a popular breakfast food: they provide your body with essential energy and nutrients to get through the day. Eggs are a great and healthy food for gaining mass because they’re inexpensive, readily available, and they give you a ton of cooking options so it doesn’t get stale.One egg has about 75 calories, along with 5 grams of fat and about 6 grams of protein, as well as essentials like vitamin B-12. I wouldn’t eat too many of them in a single day because of the cholesterol, but enjoying eggs several times a week is a good practice, and it’ll certainly help with your weight gain goals. Nuts have one of the highest amounts of energy for their weight of any kind of food, and they’re certainly one of the healthiest of the calorie dense food groups out there.A 100 gram serving of macadamia nuts, for example, has over 700 calories! They’re a healthy snack rich in calcium and fibre. They’re an extremely great food choice for gaining weight quickly because they’re easy to pack and delicious.The downside? They tend to be expensive, and they have a high fat content. That being said, I’d definitely look into nuts and seeds as great, portable energy sources on the go. Try to get them dry roasted and unsalted. Yes, I’m not kidding! In moderation, dark chocolate is a great choice as a treat food for gaining mass. A 100 gram bar of chocolate has over 500 calories, and it’s loaded with antioxidants and enzymes that improve your mood. There’s also sugar and loads of saturated fat (which is part of why it tastes so good) so this isn’t an ‘every day’ kind of food supplement to gain weight. However, a few pieces every day certainly won’t hurt you, and every extra little bit of caloric intake helps increase your mass. It’s a treat, but it certainly doesn’t hurt, and it’s a lot better than many types of candy and junk food out there. Soybeans are a staple of mine because they’re healthy, inexpensive and full of nutrition. There’s a lot going on in that unassuming little green pod. A 100 gram serving of soybeans has 400 calories. That includes very little in the way of fat, and an astounding 36 grams of protein! By weight it’s a better protein source than red meat. Did I mention it’s also a significant source of magnesium, iron and calcium? I can’t think of many downsides to it. My favourite form is edamame, or boiled whole soybean pods. It takes about 4 minutes to prepare and it’s amazing as a snack or a supplement to a main. I’d definitely encourage you to incorporate soybeans into your diet. CHEESE: WHAT WOULD LIFE BE WITHOUT IT? I’m a huge fan of cheese, and it happens to be an amazing supplement food to put on extra weight. It’s calorie rich and full of good stuff like calcium. It’s a viable protein source for you vegetarians out there, and it’s easy to add to most dishes by means of shredding or sprinkling. Like all other fatty foods, it’s definitely something to enjoy with a bit of moderation.Cheddar cheese, for example, has 400 calories in a 100 gram serving, and that includes 100% of your daily recommended intake of saturated fat; fantastic energy density per serving, but not the best thing to binge on! It is, however, delicious, nutritious, easy to add to any recipe and relatively inexpensive, so it’s a weight gain supplement food that you should definitely add to your repertoire. Try to get yourself some sort of eating schedule. The downfall of many skinny people is just not eating enough. A schedule or meal plan is a huge help in packing on some weight by intentionally adding extra meals in. Your body will take time to adjust to a more consistent meal schedule, and more frequent snacking. That’s normal. Try to stick with it even if you’re not super hungry. Drinking lots of water is important when you eat more. Water helps move the nutrients around your body, and will provide a bit of supplementary mass in the form of water weight. Be sure to keep hydrated.